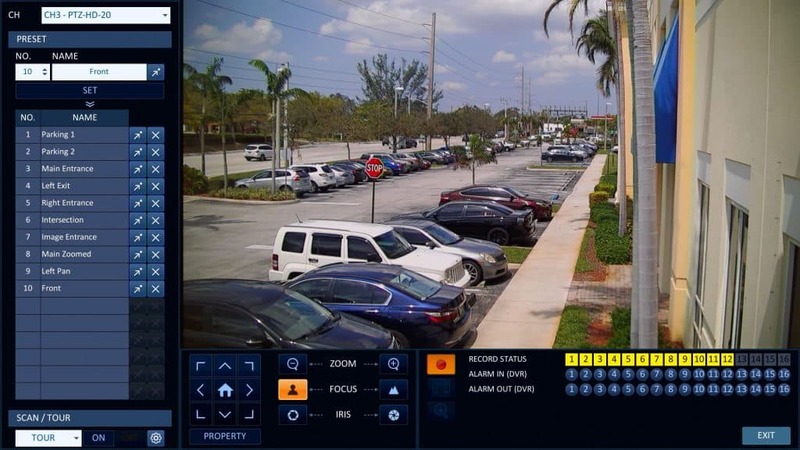 20x HD PTZ Camera Captures Surveillance Video 550 Feet Away! 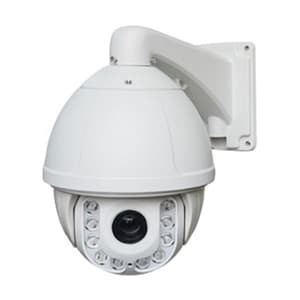 We recently installed this HD PTZ camera with infrared and 20x zoom at CCTV Camera Pros office. 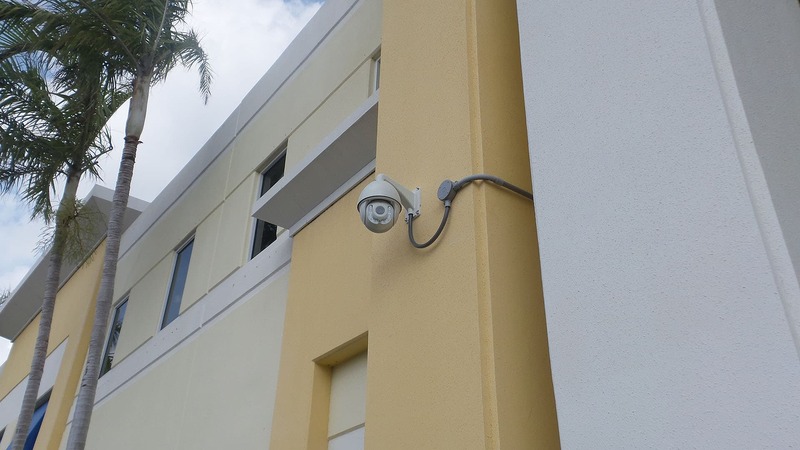 The PTZ-HD-20 is mounted on the front of our building. 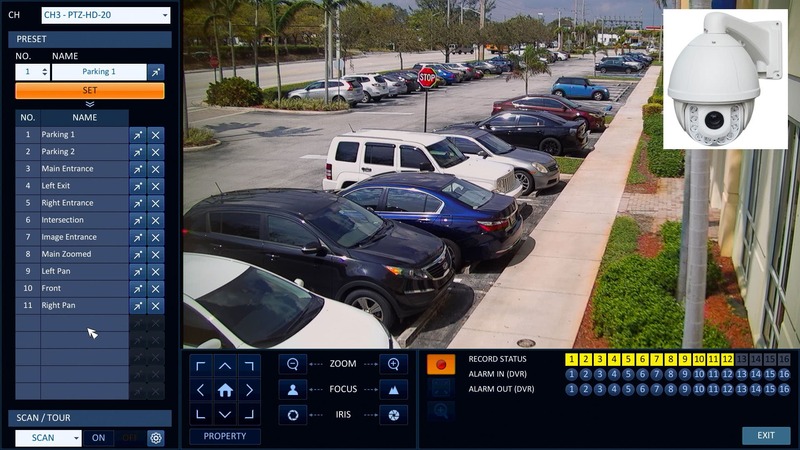 It captures video surveillance of our entrance and parking lot. The camera is hard wired to an 16 channel iDVR-PRO surveillance DVR using RG59 Siamese coax cable. The DVR is located in our data / server closet inside the office. A really nice feature of this camera is that it supports UTC. UTC stands for “Up the Coax”. It means that the PTZ commands are sent over the same coax cable as the video. There is no need to run an addition pair of cables for RS-485 communication. RS-485 use to be the industry standard way to connect pan tilt zoom cameras to controllers and DVRs. Installers really like the new UTC standard. This is the test that I ran to see how well the 20x zoom works on this camera. 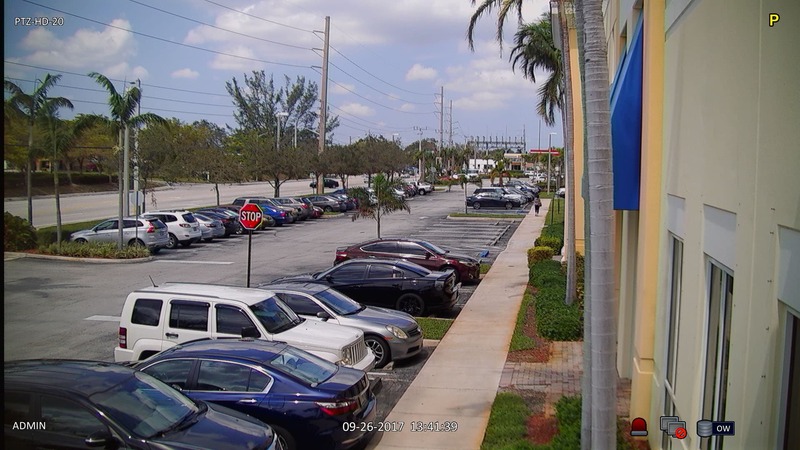 This is the camera view on the DVR when the camera lens is facing the right side of our parking lot. The lens is zoomed all the way out to the widest angle in this picture. 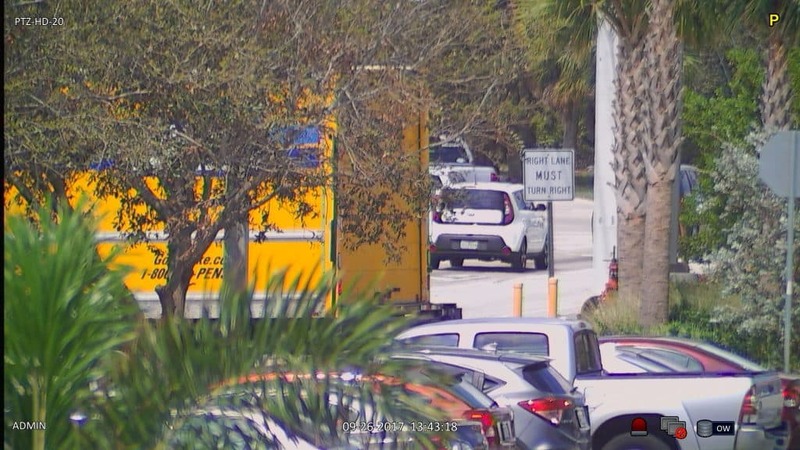 In the distance there is a street sign just before the intersection Hypoluxo road and Seacrest Blvd. 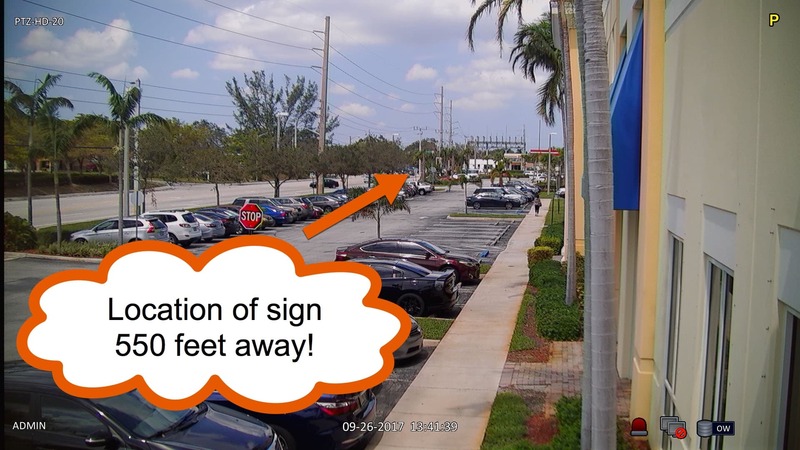 The street sign is located 550 feet away from where the camera is installed. Using the pan tilt zoom controls built into the user interface of the iDVR-PRO, I zoom into the street intersection as far as the camera lens goes. This is the view of the sign with the camera lens at the full 20x zoom. Watch this video to see the actual surveillance video captured while I was testing. I am controlling the camera using the USB mouse that is included with the DVR. Although I did not demonstrate it during this test, the PTZ-HD-20 also has outstanding infrared night vision built-in. It is a 4-in-1 camera that supports the following 1080p video modes (1920 x 1080 resolution): AHD, HD-TVI, and HDCVI. It also supports traditional analog CCTV mode with 960H resolution (960 x 480). This means that it can be used with any of those DVR types. I highly recommend the iDVR-PRO which supports HD-TVI and AHD cameras. You can learn more about the PTZ-HD-20 here. 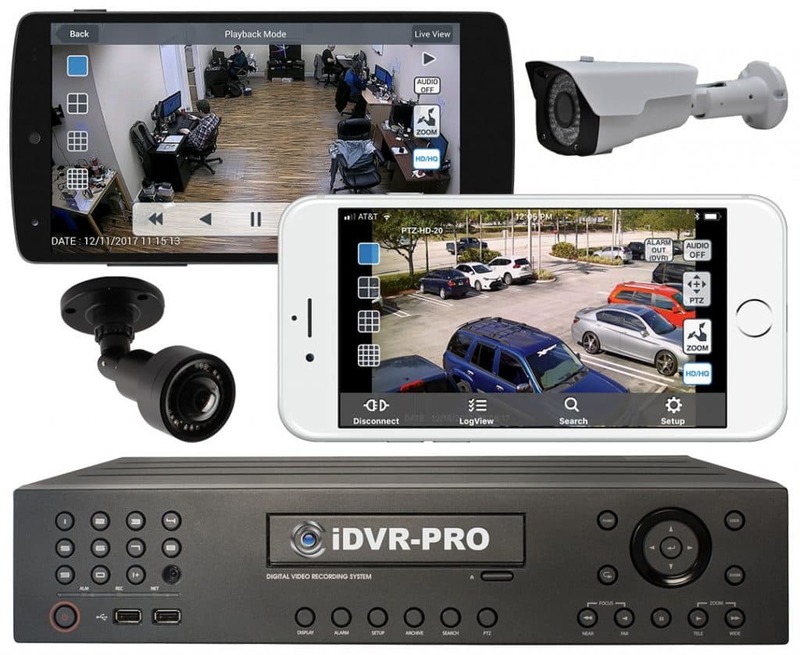 We have a demo DVR setup at CCTV Camera Pros to let customers remotely login to experience remote viewing access. Users can login using Windows and Mac software. 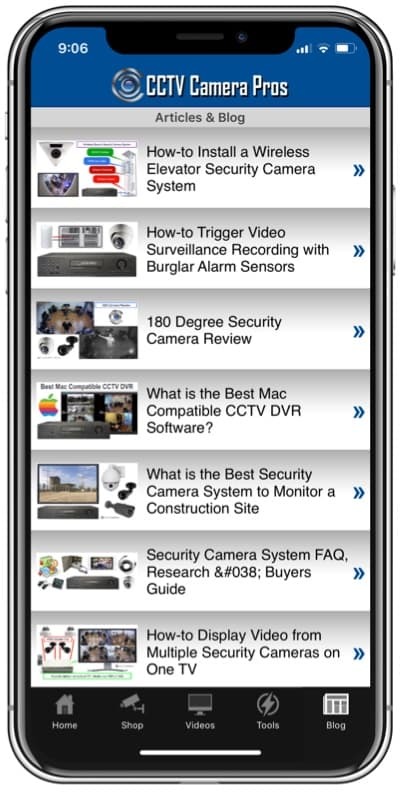 The demo also supports remote viewing from iPhone and Android mobile apps. You can request a demo here.